PewDiePie has announced a special event, but it won’t be live on his native YouTube. Instead, he will use a blockchain-infused streaming service DLive – and he’s giving away a bag of money to help promote the budding network. 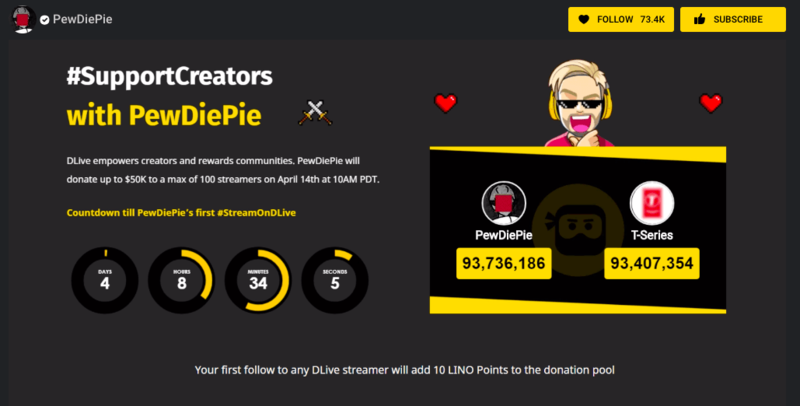 On April 14, PewDiePie will donate up to $50,000 to 100 users in a livestream on DLive. DLive donations can be made via PayPal, but all funds are immediately converted to LINO cryptocurrency at a conversation rate of $0.0012 per token. The dapp promises to be a fairer alternative to major video platforms like YouTube, which keeps upwards of 45 percent of revenue made through ads and donations, Newsweek reports. “90.1 percent of all donations and paid subscriptions made using the Lino blockchain will be paid algorithmically to the content creators, and the remaining 9.9 percent will be held in reserve by the blockchain protocol and distributed to all LINO stake holders,” reads LINO’s docs. Developers (like DLive) are urged to not take any additional cuts from viewers’ payments to content creators, as they are intended to be rewarded by the ecosystem itself. LINO’s blockchain uses Tendermint’s BFT-based Proof-of-Stake consensus method. This means token holders can lock their funds and use the weight of their stack to vote on governance issues, like system upgrades and other protocol changes. Content creators can only stream and upload videos if they run LINO nodes. It also employs an “interesting” algorithm called “Proof of Content Value,” a supposedly fair metric built into the LINO blockchain that measures revenue generated from content. It promises to prevent bots from gaming the system. LINO says it relies on a system called “Proof of Human Engagement,” which distributes rewards based on how much users interact with the platform. “In the future, the reward distribution algorithm will evaluate a viewer’s watching time, chat frequency, and donation behaviors to fairly allocate the reward,” promised LINO. LINO seems awfully similar to other content-driven blockchains like STEEM. In fact, DLive was actually first deployed on STEEM, and once touted as the first of its kind on that network. Now, it’s running on the LINO testnet. The common belief shared by LINO marketing materials is the network should be capable of handing up to 10,000 transactions per second. PewDiePie has upwards of 90 million fans, so odds are, we’re about to find out how valid those claims might be. As LINO is still a testnet, the event will likely serve neat benchmark of its capabilities, especially considering the weight of PewDiePie’s fanbase. It also has to be said that even though DLive is hosted by a blockchain (technology that’s traditionally censorship-resistant), this won’t mean PewDiePie will have license to push too many “creative boundaries” (if he wanted to, that is). Indeed, DLive recently deplatformed Alex Jonesfor infringing upon its strict content guidelines against potentially offensive content, which read eerily similar to YouTube and Facebook’s list of norms and standards. Jones had previously been banned from YouTube, Spotify, Apple, and Facebook. Sadly, this is likely not the decentralized streaming revolution we’ve been looking for. Who would have guessed. Previous articleCongress Is Pushing a Blockchain Bill. Does It Defeat the Point of Decentralized Tech?